Demand-side platforms or in short DSP is basically an advertiser campaign management platform providing features such as buying ad placements online in real time for advertisers. Buying an ad placement in real-time through a DSP gives advertisers the opportunity to target the intended audiences as they are browsing websites. A DSP is usually managed by an in-house marketing team, advertising agency, or an agency trading desk which specializes in real time advertising. By providing transparency into conversions and impressions, dJAX DSP help advertisers plan and spend their digital advertising budget in an efficient and effective manner. Most of the time dJAX DSP is packaged into advertiser campaign management product that can control and manage ads across mobile, search, display, social and video advertising channels. In order to purchase ads in real-time, DSP integrates with an ad exchange that serves as a marketplace for the ad inventory. Publishers use a SSP to sell their ad inventory in ad exchanges. Some DSPs can also integrate directly with SSPs to emphasis direct buys and the RTB process is not mandated. Demand-side platform (DSP) is used to purchase digital advertising (display, video, mobile and search) in an automated way. DSPs are mostly used by the advertisers and agencies which enables them to buy display, video, mobile and search ads. Demand side platforms facilitate buyers with direct Real Time Bidding access across multiple sources of inventory. DSPs are directed at advertisers. It enables the buyers to get access to more publishers and then choose the best as per their requirement. 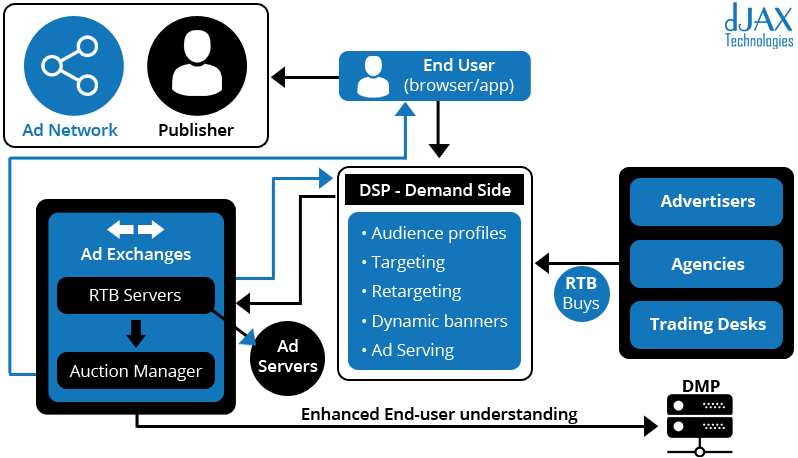 DSP enables advertisers to purchase impressions across a range of publisher sites, but targeted to specific users based on information such as their location and their previous browsing behaviour. The price of each impression gets decided through real-time auction, a process also known real time bidding. This means there’s no need for the sales person to manually negotiate prices with buyers because the impressions get simply auctioned off to the highest bidder.